Company description: Anne Reeves specialises in contemporary solid silver jewellery and giftware that is distinctive, yet very wearable. Using traditional silversmithing techniques she takes familiar shapes and gives them a modern twist. All items are designed in her Shropshire workshop. I’m married and mum to two boys, so wanted a better work-life balance. I needed to find a way to grow my business that would also enable me to spend more time with my family. What steps did you take to make e-commerce sales? I thought people would want to see and touch jewellery and initially wasn’t convinced about online retailing, but I researched artists I respect and admire to get some inspiration and I also discussed it with my peers in the Made in Shropshire group. Having decided to embrace the world of online retailing, I became a trader with Notonthehighstreet.com and then redeveloped my own website to offer an online shop. I took the following steps. Compared online marketplaces. I considered alternative online marketplaces such as eBay, Amazon, Notmassproduced.com and Red Direct, and opted for Notonthehighstreet.com because it was the right niche for me. I wanted Anne Reeves Jewellery to be found among other artists making handcrafted, limited edition pieces, rather than mass produced work. Looked into grants and organisations that could help. It cost £750 to set up the Notonthehighstreet.com shop within a shop and with website design and redevelopment charges, I probably spent around £2,000 getting myself properly established online. I joined Women in Rural Enterprise (WiRE) and through this organisation secured a £750 grant from my county council. Tested the market first. I’d set up an information website in 2006, developed my first e-commerce site 12 months later and joined Notonthehighstreet in 2010. There was a two-year crossover period during which I was selling at craft markets and building my business online. Considered payment processing and e-commerce options. Originally, I used a bespoke e-commerce platform, but I’ve now switched to Shopify, which is much cheaper at around £20/month, and is very easy to update. You basically fill in the template and add a payment gateway – I started off with PayPal as my payment processing solution, but also use WorldPay these days, because PayPal can be expensive when you’re paying a fee per transaction. Shopify also gives me the facility to add other functions, such as a trade website and special discounts, as my business grows. Built a website that reflects your brand. 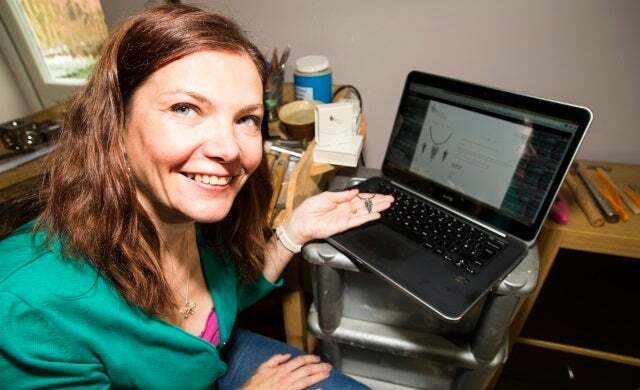 I design jewellery not websites, so turned to Andrew Garner at Surefire, a trusted web design company my husband has dealt with for years, for help in creating my online presence. Do you know your market? Work out how to use the internet to stay ahead of your competitors. Do you think like your customers? They don’t meet you face to face, so it’s important to anticipate what they need to know, making sure all descriptions of items you sell online are accurate and using top quality images. Is your customer service up to scratch? Reassure customers it’s safe to buy, deal promptly with queries and implement a robust returns policy to deliver an experience customers will want to repeat – and tell their friends about. What one piece of advice do you think they should take on board? Never rest on your laurels. Once you’ve set up your online presence, find ways to build customer loyalty and encourage people to keep coming back. Don’t try and do everything yourself. My assistant joined me six months ago and I wish I’d brought her on board much sooner!